St. James House of Prayer Episcopal Church (SJHOP) traces it roots to two of Tampa's historical churches; St. James and House of Prayer. The modern roots of St. James House of Prayer began on November 10, 1996 when the predominantly black St. James Episcopal Church and the racially integrated Episcopal House of Prayer worshiped together for the first time. Three months later on February 16, 1997, the churches officially merged to become St. James House of Prayer Episcopal Church. St. James Episcopal Church was founded in 1895 to serve the predominately black Bahamians and Cubans from Key West who followed the relocation of the cigar industry to Tampa. With them, they brought their high Anglo-Catholic traditions. Many were converts from Roman Catholicism. The Episcopal House of Prayer, established in 1907, was the third white Episcopal Church in Tampa. In 1923 the Church moved to the unique stone building which St. James House of Prayer occupies today. 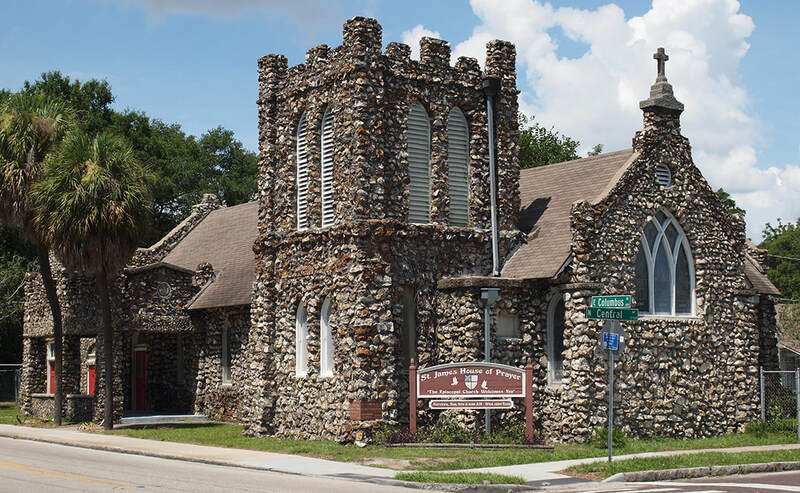 In the 1960’s, Episcopal House of Prayer became one of the first integrated churches in Tampa when three St. James families visit on an exploratory basis and later became members. On February 21, 1991 the church building was added to the National Register of Historic Places. The historic 1997 merger of these two churches was precipitated by several events. First was the sale of the St. James’ church building to the local school board to build a new high school. This left the St. James mission without a physical home. Second was the declining membership and pledges of Episcopal House of Prayer, the loss of its rector, and the loss of its parish status. This left Episcopal House of Prayer in a precarious situation and led to the “marriage” of the two churches. This solved problems for both congregations, it gave St. James a physical home and Episcopal House of Prayer a priest and new members. As Vicar of the newly formed mission, the Rev. Denniston Kerr guided St. James House of Prayer to full parish status in 2001 thus making him the first Rector of this new body in Christ. As a newly merged congregation, St. James House of Prayer continued past programs of both former churches such as Episcopal House of Prayer’s Cornerstone Kids outreach ministry for neighborhood children and the former St. James’ annual Lincoln-Douglass Ball. New programs were also added, participation in the Dominican Republic Mission trips. In the early 2000’s St. James House of Prayer held its first Discovery Weekend where it became clear that spiritually, culturally and socially the two former churches were well on their way to becoming one. Today St. James House of Prayer has a strong, loyal and faithful congregation where worship, fellowship and outreach are crucial to the fabric and development of community. Everyone is welcome. This is especially evident at the church’s Coffee Hour which is held between the first and second services. St. James House of Prayer truly tries to offer welcome to everyone searching for a place to call home.